You’re up earlier, are more active and working up an appetite. Or maybe you’re looking for a way to celebrate the weekend or a special occasion with that someone special. Brunch is about fueling up, feeling good and lingering just a bit longer at the table together. Do a brisk hike of Tubbs or take a drive around the lake. Either way you’re right next door to DOCKSIDE RESTAURANT at the Coeur d’Alene Resort, where brunch is a way of life. The spread is epic: fresh fruit, seasonal salads, mountains of pastries, an entire lineup of entrees from smoked bacon to eggs benedict to French toast, savory meats carved on the spot, omelettes and crepes to order, and a whole table just for desserts. Don’t forget the kids’ section and mimosa bar. Holidays also mean extra special buffets at the resort (reservations required). 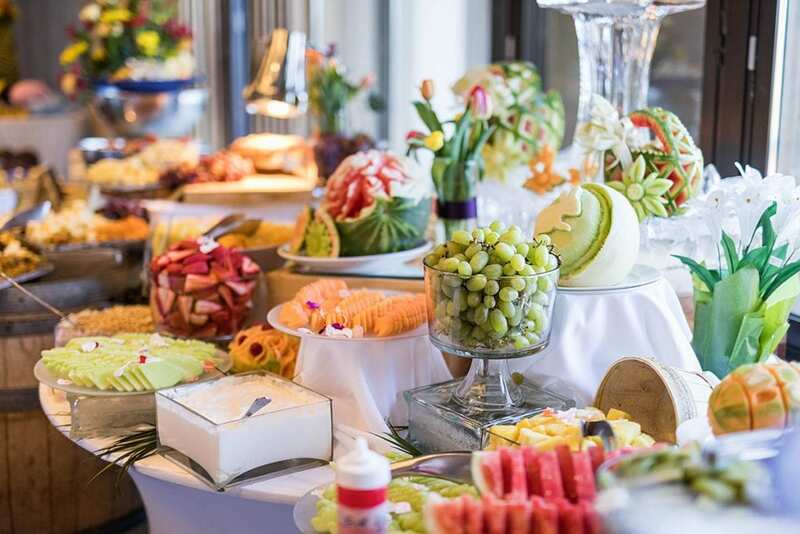 DOCKSIDE’S Easter and Mother’s Day brunches are particularly elaborate, with made-to-order eggs benedicts, signature seafoods and decadent dessert stations that include fresh fruit tarts, cupcakes, cake pops, Dockside’s signature cheesecake, filled Florentine’s and much more. (8 am-4 pm; $59.95 adults; $30.95 children 5-12; children 5 and under free) BEVERLY’S Easter brunch is also designed to wow, with artisan crepe and omelette stations and exquisite displays of fresh fruit, salads and pastries. Take note, that the start of the brunch cruise season is right around Father’s Day. Lucky dad. (9 am-3 pm; $47 adults; $24 children 5-12; children 5 and under free). to include carved pork loin, omelettes to-order, Belgium waffles, smoked salmon, chilled crab and shrimp, chicken fried steak, pastries, fresh fruit, and more. Not everyone is a buffet fan, however, and Coeur d’Alene has plenty of breakfast options right downtown. Have Sunday brunch at HONEY EATERY & SOCIAL CLUB, with outdoor seating in warmer weather. Try steak and eggs with a bloody mary or the Idaho potato donut and a stout cup of coffee. Nearby on Sherman Avenue, RUSTIC is both a bakery and restaurant, serving freshly made meals as well as take-home baked goods. Try a bagel, the breakfast panini or “hangover hash” (and add a pint for just a couple bucks more). 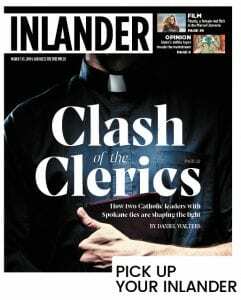 In midtown Coeur d’Alene, brunch options include TEN/6 for New Orleans-inspired cuisine like red beans and rice, beignets and crawfish biscuits. The GARNET CAFÉ is an eclectic little eatery with a huge reputation for big plates of from-scratch breakfasts, like duck confit and eggs and omelettes named for Idaho locations… like the Coeur d’Alene with house-smoked ruby red trout. Based on the Victor Hugo’s epic story of love and acceptance, this lushly scored musical features songs from the Disney animated feature’s Academy Award-nominated score, as well as new songs by Menken and Schwartz. $19-25; 7:30 pm; Salvation Army Kroc Center. The ski season is winding to a close — so end it on a high note at Silver Mountain. This weekend features the rowdy Leadman competition, and an on-mountain easter egg hunt. Go to visitcda.org for more details. This is the 15th year North Idaho Men’s Rugby Club has hosted a free Easter Egg Hunt in Coeur d’Alene. This year’s hunt features 8,000+ eggs. Find a Golden Egg and receive additional prizes. There will be designated areas for all ages so everyone has an opportunity to fill their basket! Hoppy the Bunny will be there ready to have his picture taken! Free; 1 pm; Fort Sherman Playground. Talk about a quick transition! No sooner were we talking about skiing than it’s time to talk about golf. While there are plenty of places in the Coeur d’Alene area to get your game on, remember that — just like skiing — course openings are weather dependent so make sure to call and confirm before you set a tee time. 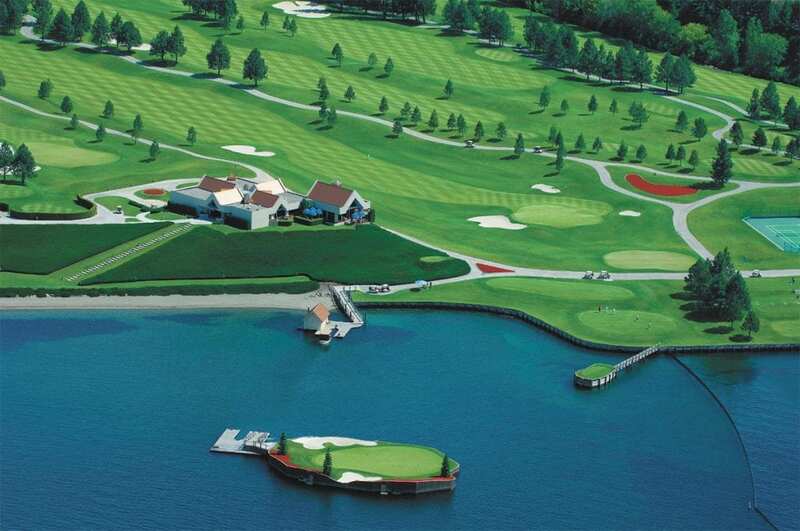 Start your tour of exceptional courses at the COEUR D’ALENE RESORT GOLF COURSE, once described as “America’s Most Beautiful Resort Golf Course” by Golf Magazine. Stunning views of the lake, immaculate greens, expert service and the world’s only “floating green” make this 200-acre, Scott Miller-designed course a must-do. What would make playing this world-class course even better? How about the opening day special on Friday April 12, starting at $99 for an overnight stay and golf for two. Or sign up for the annual Scotch Open and celebrate the birthplace of golf on Saturday, April 13, including whiskey tastings. Dressing the part is encouraged — golf for two and an overnight stay, starting at $143. The COEUR D’ALENE PUBLIC is open for business starting April 16, offering a walkable, tree-lined par 72 course developed by civic-minded leaders in the 1950s so that all could enjoy playing. Need to work on your waggle? Book a session on the Public’s popular golf simulator (starting at $20/half hour). und on a sprawling par 71 course. Ask about stay-and-play opportunities — you can even bring your motor home — which include rounds of golf, your cart and discounts at its charming clubhouse restaurant.CIRCLING RAVEN at the Coeur d’Alene Casino is a one-of-a-kind jewel tucked into 620 acres of woodlands, wetlands and terrain that’s also home to plenty of wildlife. Make it an overnighter with their popular stay-and-play packages (starting at $223), or pair your day on the course with any number of other amenities: dinner at one of their in-house restaurants, a little me-time at the spa or even a night enjoying premiere entertainment in the Casino’s newly redesigned event center. Every second Friday from April through December, stroll through beautiful downtown Coeur d’Alene and enjoy the many galleries representing locally and nationally acclaimed artists. Visit supporting galleries, shops, restaurants and businesses for this free, family friendly event. 5-8 pm. Go to visitcda.org to download a map. Enjoy wine tastings while strolling through some of your favorite downtown Coeur d’Alene shops, as they are transformed to pop up tasting rooms featuring 20 wineries and 45 different varietals. $20; Registration at the Resort Plaza Shops; 3-8 pm. 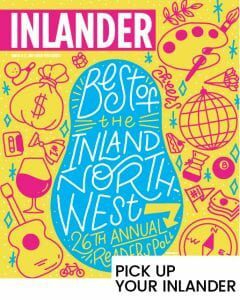 There isn’t a more delicious weekend to visit North Idaho than during the two day food extravaganza, which includes cocktail competitions, wine pairing and tasting classes, exquisite wine lunches and dinners featuring Doubleback, Barrister, J. Lohr Winery, Coeur d’Alene Cellars, Amavi Cellars, Townshend Cellars, Dunham Cellars, L’Ecole, Long Shadow Vintners and Pepper Bridge Cellars, not to mention yoga and guided hikes, paired with a tasty breakfast bar. Go to visitcda.org to view a detailed schedule and purchase tickets. Sometimes more is better, like at the second annual COEUR D’ALENE FOOD & WINE FESTIVAL, April 12-14. 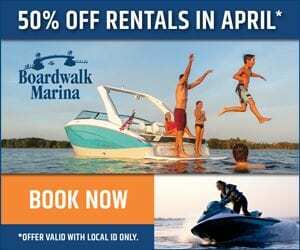 The weekend kicks off Friday with three events: an evening dinner cruise with J. Lohr winery ($51.50); a wine tasting social with complimentary hors d’oeuvres and a cocktail competition ($59), and a dress-to-impress wine dinner at Beverly’s featuring Doubleback Winery ($225). On Saturday, salute the sunrise with mimosas and a breakfast bar, then settle in for morning yoga or join a guided nature hike of nearby Tubbs Hill ($49). Enhance your wine-tasting knowledge with afternoon activities, including two wine tasting panels ($35), followed by either a tasting session with Walla Walla winemaker Gilles Nicault of Long Shadows or cocktail class ($35). Saturday offers four wine tasting luncheon options ($69) in four separate and equally lovely locations: Coeur d’Alene Cellars at Cedars Floating Restaurant, Barrister Winery at Beverly’s, Amavi Cellars at the Resort, or Townshend Cellars at the Floating Green Restaurant. Art lovers will appreciate a new artist den and Idaho wine tasting event sponsored by the Idaho Wine Commission which pairs Idaho wine with regional artists ($10). Spend a casual afternoon on a self-guided wine walk through downtown Coeur d’Alene ($20/eight pours). Conclude your evening with one of four wine pairing dinners, each one featuring a Walla Walla vintner in an intimate setting with exclusive access to the winemaker ($175). Start Sunday with brunch at Dockside Restaurant (prices vary), followed by a sip and signing with special guest author, Debbie Macomber ($40 single/$60 couple). Later that afternoon, enjoy a range of regional wines as you watch local chef Chad White demonstrate the culinary artistry that helped earn him a spot on Bravo TV’s Top Chef ($49). Of course the resort has festival packages, with overnight accommodations and the opportunity to customize your weekend experience (starting at $219). Join North Idaho College and the Human Rights Institute for an afternoon of games to celebrate the International Day of Sports for Peace with a community dodgeball tournament. Includes concessions, kids’ activities, vendors and more. Open to teams of six. 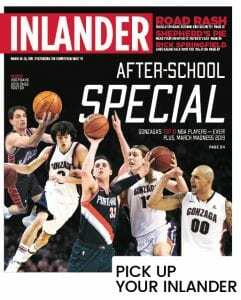 5-8 pm: North Idaho College. 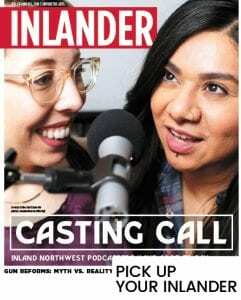 Learn more about these North Idaho breweries, Bombastic and Radio Brewing, and enjoy $2 pints of Radio beer on tap, with Bombastic bottles for sale as well. 2-7 pm, 11100 N. Airport Rd. Question: would your love of the blues be enough to send you all over the Northwest? Or would you rather hang out in Coeur d’Alene and let some of the region’s leading blues musicians come to you? If the answer is yes to Coeur d’Alene, then pencil in the 10TH ANNUAL BLUES FESTIVAL, March 29-31. Instead of traveling to California to hear hard rockin’ Harlis Sweetwater, or to Oregon for the 2019 Blues Foundation Music Award Nominee Ben Rice Band, choose from nearly two dozen musical acts playing at the Coeur d’Alene Resort and surrounding venues all weekend. 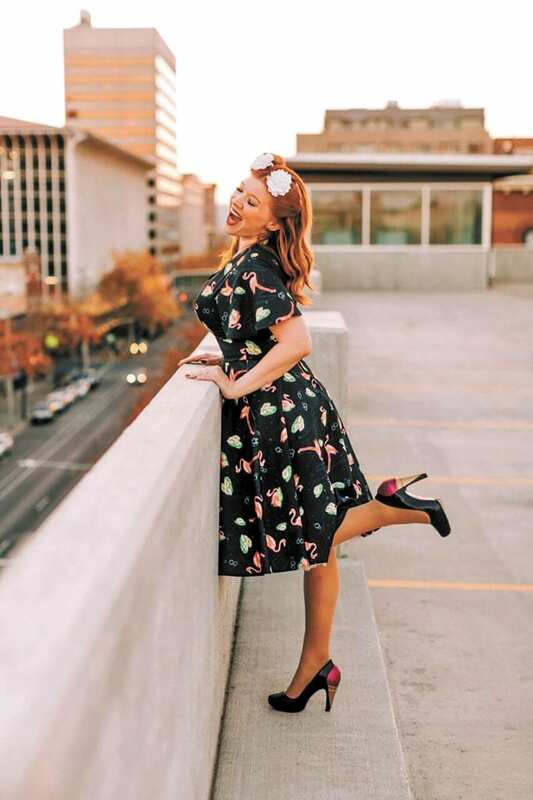 Kick the weekend off with free entertainment Friday: Spokane’s own Sara Brown Brand in the Resort lobby and the Doghouse Boyz, followed by Pat Coast in Whispers Lounge. Book now for the Friday night blues cruise ($25) and enjoy two bands, Coyote Kings with Tiphony Dames and Diego and the Detonators. Or motor to the Coeur d’Alene Resort’s convention center for a concert with local fave, NuJack City ($15). On Sherman Avenue, the party is at Taphouse Unchained with Randy Knowles and Bobby Patterson, who is also rockin’ the cruise boats on Saturday, March 30, with his band. Saturday, head up to the resort’s rooftop for MasterClass Big Band, which pairs top student musicians with local music professionals to perform hits from contemporary artists, R&B and the Great American Songbook ($5). Robb Boatsman performs in Whispers Lounge (free), while Bobby Patterson revs up the crowd with an all-ages blues cruise ($11.50). Or save your strength for Saturday’s main event: seven hours of continuous music by five bands, including the Fabulous Thunderbirds ($42.50). And what are the blues if not a valley to gospel’s mountain? Voices 4 Praise Gospel Singers hit all the right notes during Sunday brunch at Dockside Restaurant (adults, $34.95; ages 55-and-up, $24.95; ages 5-12, $17.95; ages 4-and-under free). Or have brunch on the water for the final blues cruise ($60). Can’t decide? The Resort’s stay-and-play package deals let you customize your blues experience for one night ($299-$359, includes two passes to Saturday’s main event) and two night stays ($480-$540, includes two all-access passes). Find out about the VIP deal and even more options at cdaresort.com/play/events/blues-festival. What’s better than spring skiing? Spring skiing and a carnival featuring a hilarious pond skim, toboggan relay, live music and a barbecue. The relay starts at 1:15 pm (costumes encouraged) and the pond skim at 2 pm at Silver Mountain. Go to visitcda.org for registration information and more details. Located less than 40 miles from the Spokane Airport, making a daytrip to Coeur d’Alene is a low commitment venture. While it’s easy to drive over for the day, it might just be a lot more fun to take advantage of all the Lake City has to offer and stay the night. Here are some ideas of where to stay in CDA and beyond. In Coeur d’Alene’s charming downtown, you’ll find no finer accommodations than THE COEUR D’ALENE RESORT with 300+ rooms, all of which have been entirely updated with a fresh and modern twist during a three-year renovation process. Everything is new — from the lighting, carpets, draperies and wall coverings to cozier beds, brand new Ultra HD televisions and charging stations. Unparalleled lake views, the world’s largest floating boardwalk, an outdoor infinity pool and private beach and amazing dining options also add to the appeal. 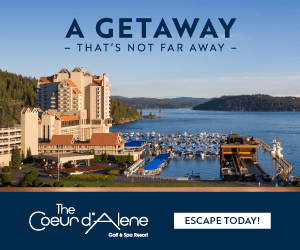 For a small additional fee, guests staying at the Coeur d’Alene Resort’s sister property BEST WESTERN PLUS COEUR D’ALENE INN AND CONFERENCE CENTER can also take advantage of the resort’s amenities, such as the pool, beach, fitness center and golf and tennis facilities. Families will also appreciate that kids eat free at the onsite restaurant, as well as the indoor pool and pet-friendly policies. 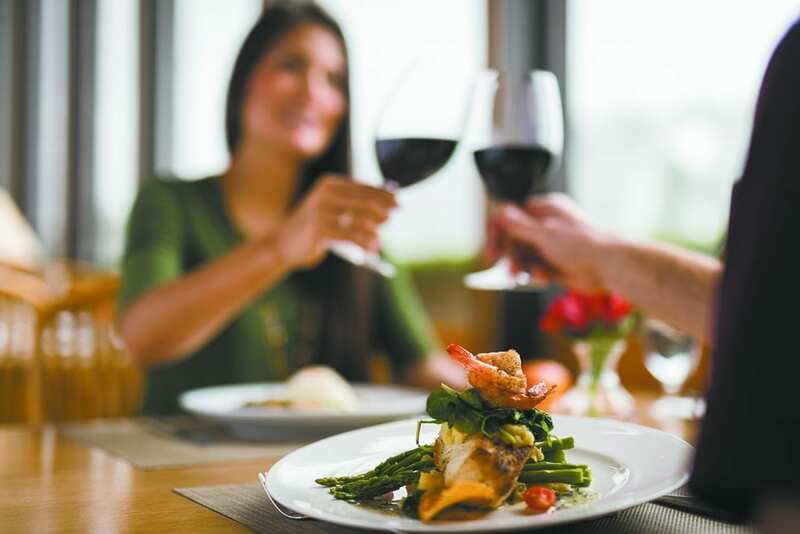 Right off the freeway, and just minutes from the trendy restaurants shops at the Village at Riverstone, is the HOLIDAY INN EXPRESS HOTEL & SUITES, which offers free hors d’oeuvres three evenings per week. If you want to work off those appetizers, the Idaho stretch of the Centennial Trail, perfect for walking, jogging, skating or biking, runs right by the hotel. Nearby, and also located on the Centennial Trail, SPRINGHILL SUITES BY MARRIOTT has all the amenities you need for a longer stay, including an all-suite setup and outdoor amenities like a splash pad, putting green, fire tables and barbecues. For a boutique hotel experience, turn to the BLACKWELL HOTEL tucked in a leafy neighborhood just blocks from downtown Coeur d’Alene. This historic hotel features 10 luxury guest suites and romantic amenities like clawfoot tubs, a wrap around porch and fireplaces. THE GREENBRIAR INN is also big on charm, and nestled in a neighborhood just minutes from Coeur d’Alene’s popular Sherman Avenue. All of the rooms of this 1908 inn are furnished with antiques, but offer modern amenities like free Wi-Fi. Guests can relax in the outdoor gazebo and enjoy the live summer music series put on by 315 MARTINIS & TAPAS next door. 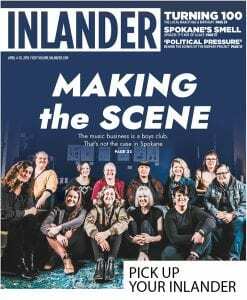 In Post Falls, explore the new menu at CURRENT KITCHEN AND BAR inside RED LION HOTEL TEMPLIN’S ON THE RIVER. The restaurant and patio are being overhauled and new owners also have new visions for the waterfront hotel situated right on the Spokane River. And if recreation is as important as relaxation, you won’t have to travel far from Coeur d’Alene for places offering both. In Hayden, stay and play at TRIPLE PLAY RESORT HOTEL & SUITES, where special offers include one night of accommodations and three two-day passes to the waterpark and family fun parks (starting at $279). 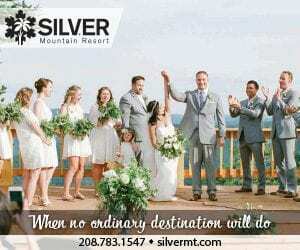 Families will never be bored at SILVER MOUNTAIN’S MORNING STAR LODGE, complete with its vibrant mountain village at the base of the ski resort, and its ginormous indoor water park open all year round. While skiing and boarding are the draws in the winter, mountain biking, golf and ziplining make even the shoulder seasons tons of fun. Southbound travelers might want to spend several days at COEUR D’ALENE CASINO RESORT HOTEL in Worley, Idaho, which has more places to eat and games to play than you can possibly accomplish in one day! Can’t get away until warmer weather? No problem. Put these two items on your list for summer: RED HORSE MOUNTAIN RANCH, a bonafide dude ranch, and WOLF LODGE CAMPGROUND within sniffing distance of the historic Wolf Lodge Inn Restaurant. Rebel Junk is a gathering of handpicked vendors selling all their best junkin’ goods like jewelry, signs, candles, garden art, antiques and more. This is the top traveling vintage market in the USA, according to the editors at Flea Market Style magazine. $5-$15; Friday 6-9 pm; Saturday 10 am to 4 pm; Kootenai County Fairgrounds; tickets available online at rebeljunk.com/tickets or at the door. This weekend is the fourth annual fundraiser for the Doug Johnson Memorial Fund. Doug was a father of four, a fixture of the Inland Northwest ski and bike industry and all around great dude. The main event is a snowboard/snowskate race against the clock through a handbuilt banked course. To register or for an event schedule, go to visitcda.org. At this rate it may be months before nature’s greenery emerges from underneath the snowpack. 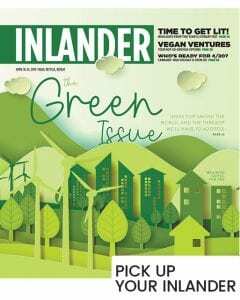 Yet from March 14-17 in Coeur d’Alene, it’s all the green you can eat, drink and make merry with all over town, parties and the parade, to green beer and Irish eats. 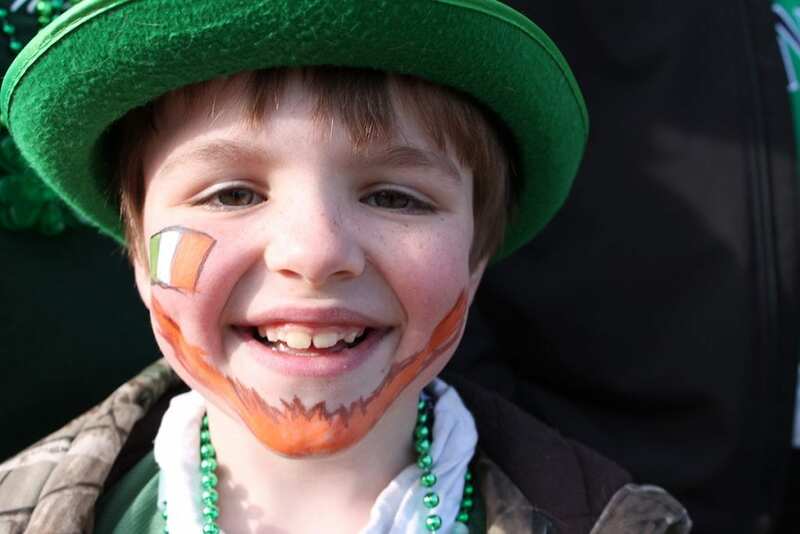 The annual ST. PATRICK’S DAY PARADE goes from 4-6 pm, ending at First Street in front of the Coeur d’Alene Resort, which is hosting its annual shindig, the COEUR D’IRISH PARTY. That starts at 5:30 pm and doesn’t stop until 11:30 pm. Feast on corned beef and cabbage, Irish stew and soda bread, go for a jar (grab an adult beverage), have a dram of whiskey and rock out to the music of local fave the Rub at this benefit for the Coeur d’Alene Rotary Club. Tickets $40. 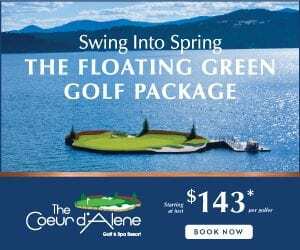 Thinking about staying over at THE COEUR D’ALENE RESORT on March 16? Talk about luck o’ the Irish. 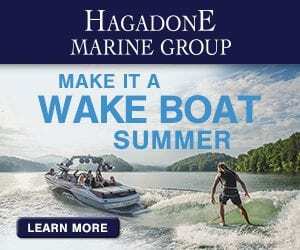 You’re invited to the SHAMROCK SPLASH BASH at the lakeside Hagadone Event Center for a soak in the heated infinity pool, dancing to the DJ, whiskey and beer tastings and yummy little appetizers. Bring a friend or two for just $15 each. Room rates start at $199. Visit the Resort’s website for more package details and to book your stay. If you haven’t been to ALL THINGS IRISH on Sherman Avenue in downtown Coeur d’Alene, you’re in for a treat on March 16. They’ll have live music (1 pm), a photo booth (2 pm) and the beloved local Coeur d’Alene Firefighters Pipes and Drums (3 pm), with plenty to look at before and after, including clothing, jewelry and home décor. You’d expect a place called O’SHAY’S IRISH PUB & EATERY to put on a stellar party on St. Patrick’s Day. And you’d be right, but not just the day of — the whole weekend, from March 15-17. Visit O’Shay’s or their adjacent pop-up bar, the SNUG, for Irish food — corned beef and cabbage, cod n’ chips, Guinness stew — and drink, from Jameson whiskey, to the tongue-in-cheeky Irish Car Bomb. You probably wouldn’t expect a place called CAPONE’S to also put on a heckuva party, but they are! 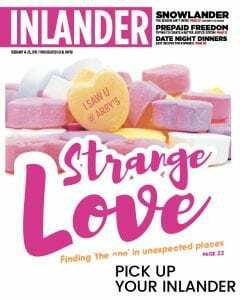 All three locations — Hayden, Post Falls and Coeur d’Alene — are celebrating with food and drink specials Saturday, March 16, and Sunday, March 17. Make sure you stop by PADDY’S on March 16 to hear bagpipers (at 6 pm and 8 pm), or March 17 for more food and drink specials and more bagpipers (at 12:30 and 6 pm). If you want to celebrate St. Patrick’s Day slopeside, then by all means wear your green with pride at SILVER MOUNTAIN on Sunday. Noah’s is serving up Irish themed drink and food specials. You’ll also find corned beef and cabbage, Guinness Stew and more Irish drink specials at The Mountain House. Lake City Playhouse presents this powerful tale of sibling rivalry between two brothers penned by American playwright Sam Shepard. $20-$23; Saturdays 7:30 pm, Sunday 2 pm and 7:30 pm. Take in this mix of Celtic, Scandinavian and North American roots music as you celebrate St. Patrick’s Day weekend. Studio 107; 6-9 pm. Learn from the Culinary Stone’s Chef Bob as he prepares some of his favorites — spicy bacon bloody mary, bananas foster french toast, spicy low-country shrimp and grits, mini Italian frittata with roasted cherry tomato sauce and more. $40; Culinary Stone; 5:30-7:30 pm; call 208-277-4116 to register. Leave it to Southern Living Magazine to offer scientific proof of what gals already know: getting away with girlfriends is good for you! 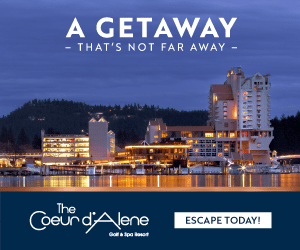 Coeur d’Alene has your staycation staples: spas, super restaurants, sweet deals on rooms, and lots of places to make memories with your BFFs. If pampering is on the list, check out the Coeur d’Alene Resort, for SPA AND STAY specials like the SPAtacular you can share with a friend. Nearby are LATHER SALON & SPA and POLISHED, which offers a light meal and adult beverages — mimosas, anyone? — with their spa specials. 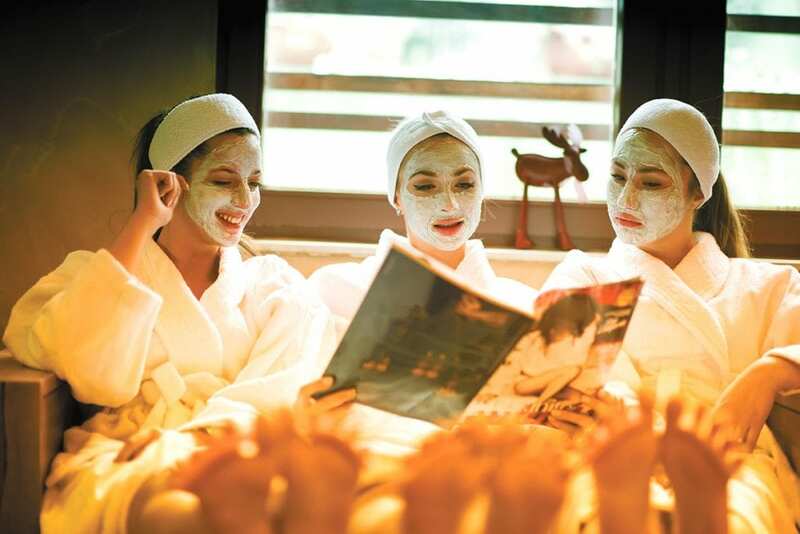 Zip into ZI SPA at Riverstone for specials like the 50-minute $99 and if the B in BFF stands for “boy,” they have great deals for guys, too. After taking such good care of your skin, hair and nails, you’ll want to nourish the rest of your body with a bite to eat. At Riverstone, try VINE AND OLIVE or BARDENAY, where festive groups are always welcome. Downtown, you’ll want to fuel up at FINE BREWED COFFEE or BAKERY BY THE LAKE, have lunch at DOCKSIDE RESTAURANT or meet for cocktails and small plates at SEASONS, where Wednesday is ladies night. Since you’re downtown, you might as well do a little browsing amongst the many unique shops, such as GRACE AND JOY or MARMALADE clothing shops, MIX IT UP home décor, ANGEL GALLERY OF FINE ART & ANTIQUES, and LUCKY MONKEY for unusual jewelry and locally designed T-shirts to commemorate your day out. 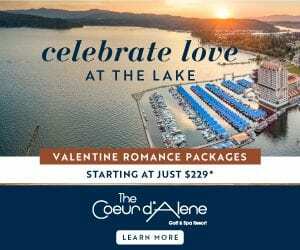 And if you’re still stuck on spas, consider the COEUR D’ALENE CASINO where you can spa, snack and play all in one location. Downtown Coeur d’Alene comes alive every second Friday with the sweet sounds of live music all throughout the city’s core. Free; 5-8 pm; for a map of locations, go to visitcda.org. Let the good times roll at Silver Mountain during Marchi Gras. The party starts at 3 pm with $15 night skiing lift tickets and a balloon drop at the Mountain House loaded with prizes like cash, lift tickets and waterpark passes. Live music at Moguls caps the evening. 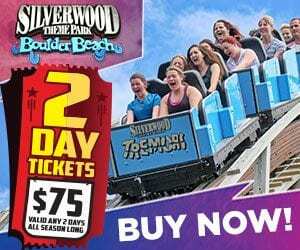 $15; 3-9 pm; Silver Mountain Resort. There couldn’t be an easier or funner way to raise money for local families battling ALS than joining the Matt’s Place Foundation Fourth Annual Pub Crawl. Purchase tickets ($25) online and then pick them up at the Resort Plaza Shops. 3-9 pm; downtown Coeur d’Alene. More details at visitcda.org. It’s easy to have some enthusiasm for winter when snowflakes first fly, making Christmas lights and holiday decorations all the more picturesque. But when the snow is still falling in March, that initial enthusiasm can give way to the winter blahs. If that’s where you find yourself, here are six different things to do that might just help you fall back in love with winter. 1. Rent a fat bike. Just because there’s snow on the road doesn’t mean you have to abandon cycling. Instead, embrace the white stuff and rent a fat bike and take the the trails. For beginning riders, you can get the hang of those wide tires on fairly flat terrain at FOURTH OF JULY SUMMIT LOOP. The more experienced rider will find groomed trails with steeper climbs at CANFIELD MOUNTAIN NATURAL AREA. For more tips on where to ride or to rent a bike, stop into COEUR D’ALENE BIKE CO. Half-day to 24 hour rentals range from $55-$75. 2. Go downhill skiing. North Idaho is blessed with an abundance of excellent ski hills. Embrace winter at SILVER MOUNTAIN RESORT, where part of the experience is a scenic gondola ride, not to mention epic glade skiing. Live music and a packed event calendar extend past winter all the way into April. 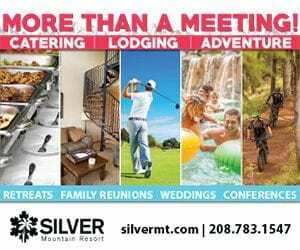 Stay at the MORNING STAR LODGE at the heart of Silver Mountain Resort’s Gondola Village, and you’ll receive complimentary admission SILVER RAPIDS, the resort’s indoor waterpark. 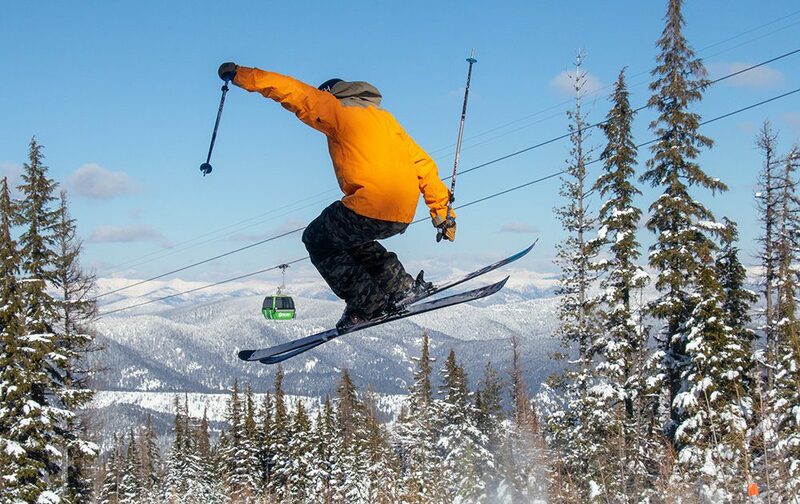 SCHWEITZER’S vibrant village is also a draw, with slopeside lodging and 2,900 acres of lift-serviced terrain which ranks Schweitzer as among the largest resorts in North America. LOOKOUT PASS also has some bragging rights, including a reputation for the best snow, with an average of more than 400 inches of light, dry powder annually. 3. 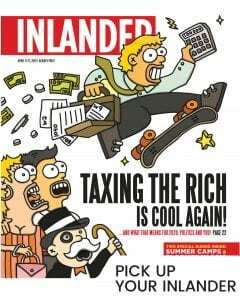 Go tubing. Nothing makes you feel more like a kid than sliding down a hill in an inner tube. And nothing makes you feel like an old man like having to walk back up the hill. So head to SILVER MOUNTAIN or SCHWEITZER where a magic carpet will whisk you back up the hill. 4. Go ice skating. FRONTIER ICE ARENA, has open skating times on Tuesdays, Fridays and Saturdays. In addition to skating classes for both children and adults, the arena offers time for hockey practice, curling, broomball and is even available for birthday parties. 5. Head to TRIPLE PLAY. There’s no end to the fun at TRIPLE PLAY FAMILY FUN PARK, from the arcade games, bowling, and laser tag, to the Raptor Reef indoor water park, where it’s always a balmy 86 degrees, even when winter remains in full force outdoors. 6. Take a cruise. While you may think boating is best in warmer weather, the snowy beauty of lake Coeur d’Alene is absolutely majestic. 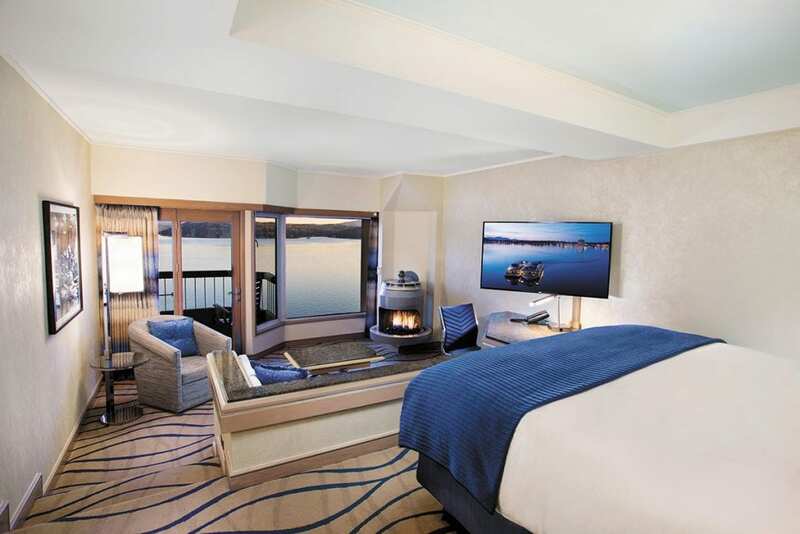 THE COEUR D’ALENE RESORT offers a variety of scenic cabin cruises throughout the winter, including hot cocoa cruises, which feature a hot cocoa bar for adults and kids. Spend two nights laughing when the Inn hosts back-to-back comedy nights featuring Tim Homayoon (March 1) and Kenny Smith (March 2). 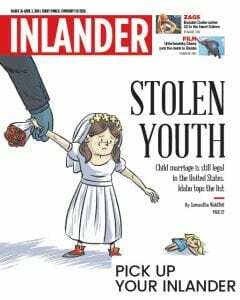 $8-$17.50; Ages 21+; 7 pm; Coeur d’Alene Inn. Sit back and enjoy the 90-minute scenic tour of the lake. A hot cocoa bar will be available on-board with hot cocoa for the kiddos, and spiked cocoa for the adults. $10-$15; Noon and 2:30 pm; See visitcda.org for more details. Enjoy tastings from over 85 wineries and breweries, along with delicious food from a dozen local restaurants at the 23rd Annual Wine, Stein and Dine. This event also features live music by Bill Bozly, a great silent auction, photo booth and more. $45; 7-10 pm; Greyhound Park and Events Center; see visitcda.org for ticket purchase locations. 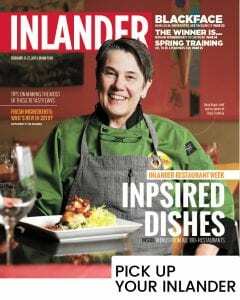 From downtown to midtown to north of the freeway, Coeur d’Alene has a slew of participants in this year’s INLANDER RESTAURANT WEEK, a three-course, fixed price menu offering which runs Feb. 21-March 2, so plenty of time to have a culinary adventure, or two, or more! 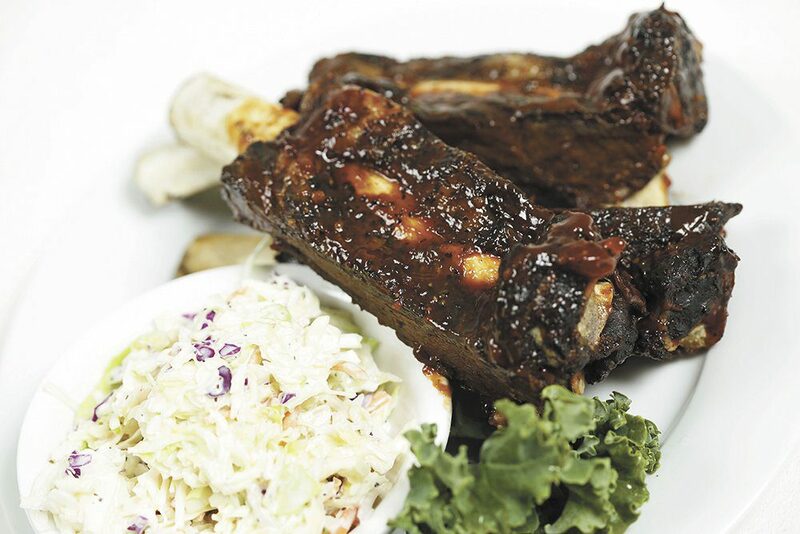 Discover SWEET LOU’S RESTAURANT & TAP HOUSE for upscale comfort food that offers you three choices for every course. Start with fried calamari, do the bison ribs and celebrate the sweet life with a skillet chocolate chip cookie topped with real vanilla ice cream. Of course, if you’re needing to walk off a bit of that dessert, you’ll find room to stroll and lots to look at in downtown Coeur d’Alene. Have a cocktail at HONEY EATERY or SEASONS — and see what these Inlander Restaurant Week participants have on their menu — or browse the shops and art galleries that make every trip feel like a special occasion. Fly up to BLUEBIRD – A MIDTOWN EATERY where your entrée choices include down-home shrimp and grits, Chilean sea bass or crispy fried chicken with a honey-miso glaze. Like all participants, Bluebird is featuring a local drink special, this one from Radio Brewing in Kellogg. Keep heading north to THAI BAMBOO and view their version of the northern lights — the unique light display on the ceiling of their spacious dining room. Start your meal with crab and cream cheese wontons, Filipino pork lumpia or Thai spring rolls. Head to the west side of town where ANTHONY’S AT COEUR D’ALENE is serving up seafood six ways, including their award-winning clam chowder. How about fresh Columbia River steelhead or chargrilled prawns with cilantro pesto? Yum. From the west side of town, head south around the lake to CEDARS FLOATING RESTAURANT where the view is lovely and the food is divine. Good luck narrowing down your choices; everything looks good, including dessert, which is a choice of Oreo cookie “mud pie,” chocolate mousse or their delightful huckleberry ice cream sundae. Haven’t driven south along the lake in awhile? Winter is a wonderful time to do so, taking an easy cruise down Highway 95 to the Coeur d’Alene Casino’s CHINOOK STEAK, PASTA & SPIRITS. Will it be pork tenderloin, local trout topped with lemon dill sour cream or halibut risotto? All good! And, since you’re already there, why not turn your culinary adventure into an overnighter? 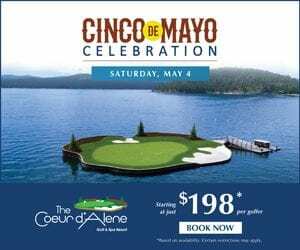 Visit cdacasino.com for the live entertainment schedule, as well as nightly room specials and information about the COEUR D’ALENE CASINO’s wonderful spa facilities. Toss in with Slate Creek Brewing Company’s monthly hiking group as they snowshoe or cross-country ski the Twisted Klister trail. This four-mile loop leads to Geoff’s Chalet warming hut, so pack a beverage or snack for a midday break. Free; 10 am-2 pm; see visitcda.org for directions to the meetup location. Come support these amazing athletes as they compete in skiing events at Silver Mountain Resort. The parade of athletes starts at 9:30 am and competition starts at 11 am. Unless you’re from the Big Easy or have taken part in New Orleans’ legendary Mardi Gras celebration, you may not be familiar with a krewe. Pronounced “crew,” it’s the organization that puts on a parade or ball during Mardi Gras. 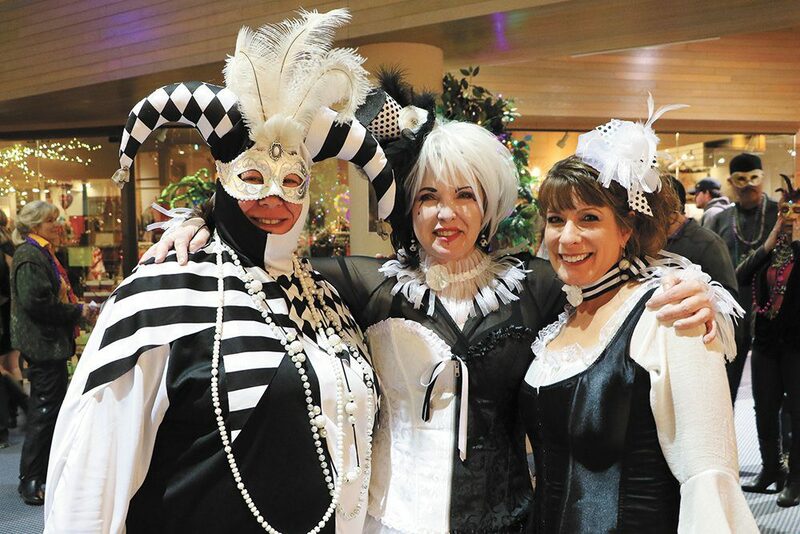 In North Idaho, the krewe behind Coeur d’Alene’s exciting Mardi Gras celebration is the Coeur d’Alene Arts and Culture Alliance. For the past three years, the Alliance has transformed the Coeur d’Alene Resort’s Plaza Shops into a lively indoor rendition of the French Quarter. And since no trip to the French Quarter would be complete without Creole cuisine, Mardi Gras Krewe d’Alene will pit seven different local restaurants against each other, all competing for the Chef’s Choice and People’s Choice awards: Angelo’s Ristorante Italiano, Bardenay, Candle in the Woods, Moon Time, Republic Kitchen + Taphouse, Reuben’s Catering and Ten/6. When you’re thirsty, stop by Lafitte’s Blacksmith Shop Bar, a recreation of the oldest bar in the country for something to sip as you stroll through the plaza shops. Keep your phone ready as you wander, because options for unique selfies abound as stilt walkers and jugglers pass by. Pause and have your fortune read, or adorn yourself with a henna tattoo or body painting. Watch as artists paint and sketch, completing colorful works right in front of you. Live music and a performance by drag queens Nova Kaine and Les Gurlz round out the entertainment. If the food and New Orleans-inspired streetscape whet your appetite for a trip to the real Big Easy, make sure you purchase a raffle ticket online or at the event, and you could win a four-day-three-night trip for two to New Orleans. Laissez les bon temps rouler (let the good times roll)! The ultimate feel-good musical, featuring the music of ABBA, is presented by Aspire Community Theater. Rated PG-13. $19-$25; Thu-Sat 7:30 pm, Sat-Sun pm 2 pm; Salvation Army Kroc Center. Drive a Toyota, Lexus or Scion out to Silver Mountain Resort on Feb. 15 and you’ll ski free all day. Warm up this winter on Lake Coeur d’Alene with a toasty hot cup of cocoa in your hands as you sit back and enjoy a 90-minute scenic tour of Lake Coeur d’Alene. A hot cocoa bar is available on-board for purchases of hot chocolate for the kiddos and spiked cocoa for the adults. $10-$15; noon and 2:30 pm. Go to visitcda.org for tickets.